Join Safe Space Inc., as we host a Free Prom Dress Shop. Safe Space Inc., realizes the importance of ensuring that every young lady has the opportunity to attend one of the most significant milestones of their high school career, without the worry of finances. Safe Space Inc., called for members of the community to donate gently used or new formal/prom dresses, along with shoes and accessories to make this event successful. 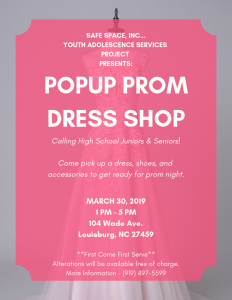 Safe Space Inc., will host a free prom dress shop, where young ladies can browse and try-on free prom dresses, receive free alterations to the dress and pick up matching shoes and accessories for their big night.